In previous articles, I've discussed how to organize your workspace for maximum efficiency and how to organize and eliminate cable clutter. In today's article, we're going to turn it up a notch and focus strictly on your backside. Your petutie. Your rump-shaker (and hopefully not your money-maker). The side-effects of a bad chair can be reflected in all types of muscle pain and ailments. Just like we should never skimp on the quality of our mattress (since you spend a lot of time on it everyday), most of us with office/non-manual jobs spend more time at our desk sitting on a chair than any other activity. So I have three things you should consider and incorporate to improve the overall experience of sitting in your home office. There are basically three concepts for creating an ergonomically-correct workspace: vision, distance, and posture. The image illustrates each concept. 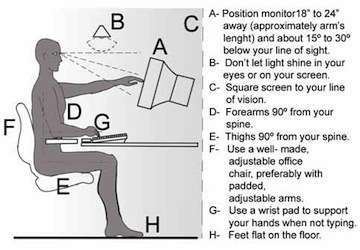 You want to ensure that you aren't squinting or leaning forward in order to see the screen on your monitor or laptop and that you can easily reach those items in your work area that you may need. A chair that provides support as well as the ability to change positions and motions is also another important feature. There are several different options for sitting in a chair that provides a comfortable seat and encourages proper ergonomics. Most “traditional” chairs now come loaded with features that allow you to adjust everything (e.g., height, armrests, back support, etc). For those of you who are more adventurous, you can try a kneeling chair (figure 2) or stability ball chair (figure 3). Some people even go chair-less and opt to work standing up (Figure 4). This stand-up desk is adjustable so that you can sit down and this particular model even comes with a treadmill. You can now work on those work projects and on your body at the same time. In his book “The 4-Hour Body”, Tim Ferriss recommends five movements that will fix postural imbalances, called The Egoscue Method. The five exercises include Static Back; Static Extension Position on Elbows, Shoulder Bridge with Pillow; Active Bridges with Pillow; and Supine Groin Progressive in Tower. The video below demonstrates all five exercises. Perform all five movements at least once per week. Years of sitting at a desk has done more damage than any of us even realize. By taking a few simple measure to focus on your posture, distance, and vision, those nagging pains and tightness could be virtually eliminated or reduced. What type of chair do you sit on? Is it comfortable?